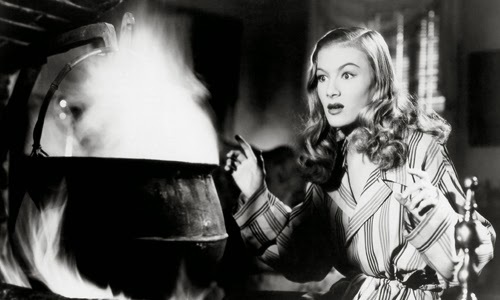 A gorgeous woman who casts a spell over a powerful, wealthy man sounds like the ideal vehicle for '40s starlet Veronica Lake, but viewers might be surprised at how literally -- and whimsically -- this idea takes shape in René Clair's I Married a Witch. Instead of the actress' wiles alone drawing in her suitor, the fabric of magic itself becomes a main attraction to this lighthearted play on romance and politics, casually taking jabs at scandal, elections, and well-to-do "arranged" marriages as a centuries-old practitioner of the dark arts meddles in the affairs of man. While it's unmistakably designed with the vacuum of a magnetic performer in mind, director Clair also employs witty situation comedy and scattered, convincing visual effects that give it distinctiveness. Providing a sublime foundation for this fantasy to draw those into Veronica Lake's effervescent sphere of influence, it's a slight but amusing fable that relies on its keen charisma to overpower the story's airiness. Based on a story written by Thorne Smith entitled "The Passionate Witch", Clair's film first embarks on establishing its supernatural center while trekking through vignettes that span two-hundred years. It starts in colonial Salem, where the father-daughter duo of Daniel (Cecil Kellaway) and Jennifer (Lake) are burned by Puritans for practicing magic, their souls trapped within a tree planted atop their buried remains. Centuries pass as descendants of those responsible for the witches' death, the Wooley family, are plagued with a curse that leaves their men with bitter, unmanageable wives. Eventually, the story lands in the magic-free '40s, where rising politician Wallace Wooley (Fredric March) is set to marry to yet another of these women (Susan Hayward) in a socially-beneficial union. A bolt of lightning seems determined to change that, though, striking the tree and freeing the witch family's spirits. Instead of the curse they're responsible for casting, they choose to directly wreak havoc on the ancestor of their killers by way of Jennifer's sultry disposition. Fanciful use of witchy power shapes the setting early on in René Clair's film, skillfully captured by cinematographer Ted Tetzlaff to accentuate the mildly-haunting essence leading up to Jennifer's return to the corporeal world, aided by Roy Webb's Oscar-nominated score. Clever little visual effects involving columns of smoke and flickering fire add a unique, ethereal presence to what's going on, such as when Daniel and Jennifer observe the nuance of '40s human behavior and lingo as vaporous wisps from behind the trees at a ritzy home. I Married a Witch eventually makes broad use of the duo's capabilities to bolster its unpretentious conflicts and foils, from mind control to creating weather anomalies, so it's a good thing to give such lighter fare a basis for its conceits -- and, from a vintage fantasy standpoint, they're just a lot of fun to behold. When a fire starts, a door slams shut, or a broom moves, the film never lets those watching out from under its quaintly immersive enchantments. Veronica Lake is the real incantation here though, once Jennifer breaks from her smoky confines and lands in the arms of Wallace Wooley. Deviously impish with a flip sensuality, she creates a manipulator out of the centuries-old sorceress who frequently tiptoes around her true nature with flippant dialogue, inviting the audience to relish her playfulness through the film's eccentricity. Her sly gazes and flirtations japes reinforce a constant awareness of Jennifer's motivations, an extended in-joke mischievously exploited by dexterous situational comedy. Fredric March suitably, if rigidly, fills the role of the object of her scorn: he tiptoes a tricky line between an intelligent, image-savvy politician engaged to an intolerable woman and a "dope" dealing with the immediate and persuasive allure of a beautiful vixen. Director Clair handles his suspicion towards Jennifer with alertness alongside the witch's reactions to the mortals' misgivings, resulting in a sparkling contentious chemistry that came naturally to the actors. Also, Cecil Kellaway is terrific as her mischievous father, especially once he's head-deep in booze. René Clair often plants little bits of satire in his comedies (look to A Nous la Liberte and Le Million for social and economic spoofs), but they're not as apparent or vital in the undemanding screwball mannerisms of I Married a Witch. While the fickleness of public image during an election and marriage for the sake of social benefit give the film a hint of substance, they're mostly used as devices towards the witch's vengeance and proof of trustworthiness in Wooley's eyes without having much to say about their place in a modern environment. Love potions, rushed matrimony, and tampering with voters exist for the pure enjoyment of beholding Jennifer's power -- and backfiring of said power -- as her vindictive exterior cracks, leading to a confection of a plot that liberally concedes to the leverage of magic. That doesn't really matter while relishing the fusion of humor and whimsy that Clair brings to the screen, though, leaving one thoroughly bewitched by the director's charms for its short duration.